CHANTILLY, VA, April 18, 2017 -- Agile Fleet announces the release of version 5.0 of its FleetCommander fleet management solution. This release features many significant improvements to the product’s maintenance capabilities, as well as next-generation user interfaces, a more responsive design, and a fresh new look-and-feel. “We’ve been unrivaled with respect to vehicle sharing technology for more than 15 years. 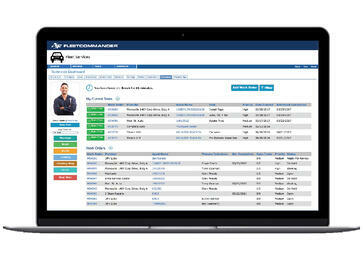 Version 5.0 is the next big step for our company, our existing customers, and the fleet management industry. Version 5.0 enhances our existing vehicle maintenance functions to appeal to a broader section of the fleet industry. Valuable enhancements such as a new Technician Dashboard, a Shop Manager dashboard, the ability to track technician time (direct and indirect), reporting on technician productivity, more flexible prioritization and assignment of Work Orders, and reports are just a sample of the new features. We’re very excited to introduce our new maintenance capabilities beyond our world-class vehicle sharing,” says Ed Smith, Agile Fleet President & CEO. Agile Fleet’s Vice President of Customer Success, Matt Wade agrees. “We’ve paid special attention to making the product intuitive and easy to learn for technicians and fleet managers alike. We listened to industry feedback and introduced technician-friendly dashboards and time-logging features that don’t require repetitive logging in and logging out of every Work Order just to record time. We think it will greatly improve technician productivity and job satisfaction. Tracking maintenance processes is easy and efficient. I’m very excited about the feedback so far,” says Wade. The release of FleetCommander version 5.0 comes in the wake of other changes at the company, including the introduction of new corporate and product logos. “This is definitely not just a name refresh and logo update. There are many forward-thinking changes happening within our products and company that the new name and logo reflect,” says Smith. Headquartered in the Washington, D.C. area, Agile Fleet is a fleet management solutions company that serves the government, university, utility, non-profit, and commercial sectors. Agile Fleet's software, hardware and services enable organizations to efficiently manage all aspects of drivers and vehicles to reduce costs, save time, and improve service. The industry’s best value in fleet management, Agile Fleet solutions delivers extensive functionality at an affordable price. Agile Fleet’s flagship product, FleetCommander, delivers the automated management of fleet maintenance, motor pools, vehicle keys, GPS & telematics, fuel, and risk management. Additional services provided by Agile Fleet include seamless integration with other systems, fleet efficiency analysis, in-depth technical support, fleet consulting, and much more. Via the National Joint Powers Alliance (NJPA) national contract and GSA Schedule, Agile Fleet solutions are available for direct purchase by states, cities, counties, all government agencies, both public and non-public educational agencies, colleges, universities, and non-profit organizations without the need to solicit competitive bids. For more information, contact Agile Fleet at 408-213-9555 x1 or Dan Fitzpatrick, Chief Sales Officer at dfitzpatrick@agilefleet.com or visit http://www.agilefleet.com.